Just to let you know that you can pick up a fully functioning, genuine, limited edition zippo lighter for £4.99 as part of a new magazine collection. I found mine in a local newsagent but you can sign up to the link posted if you prefer! So issue one is in shops now yeah ? Thanks @phillred for the picture! This is my first ever post so please forgive me! Just so you know the 2nd issue will be £9.99. 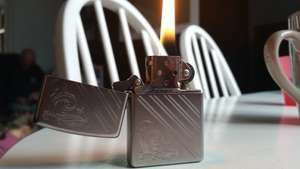 Which is still a bargain for a genuine zippo. The magazine is actually quite good too! Can't see me buying any more past the 2nd issue as they go up to £19.99 from the 3rd issue. Can u find in whsmith? Not in asda. What shop did you from? Yep picked one up today, certainly won't be paying 19.99 for future ones and issue 2 (9.99) isn't really to my taste but a nice zippo for a fiver is too good to miss, in fact my daughter has just decided she needs one for her cadet kit so looks like another trip to the news agents tomorrow. Looked everywhere for this but still can't find it! Deal posting newbie! This is Stewy87 first deal post. Help out by leaving a posting tip or just to show your appreciation for their contribution.